← World’s Prettiest Lakeside Village? 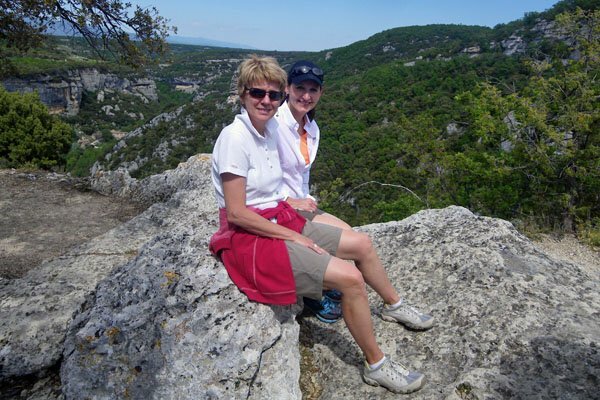 People sometimes ask if we get tired of leading our Luberon Experience trips. After all, we’ve now hosted 26 groups over seven years. We do take most groups to many of the same places, but the people always make it different and no two weeks are ever quite the same. Most importantly, we love the area and we’re always happy to be back. 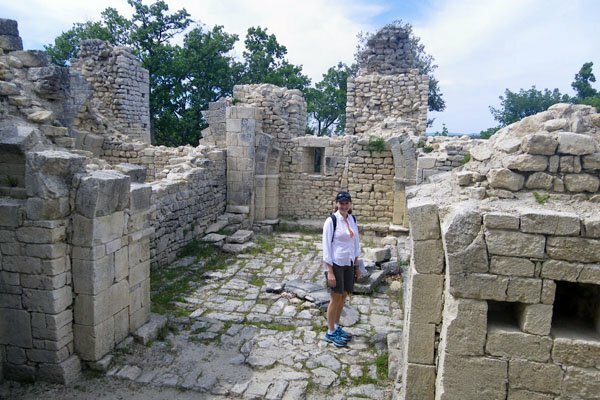 One place in the Luberon I’m always happy to visit is Fort de Buoux, an incredible site tucked in a narrow and rocky valley near the pass that cuts through the Luberon mountains between Bonnieux and Lourmarin. A small river, the Aiguebrun, winds its way through this valley. Once it must have been quite substantial… today it’s usually just a trickle. 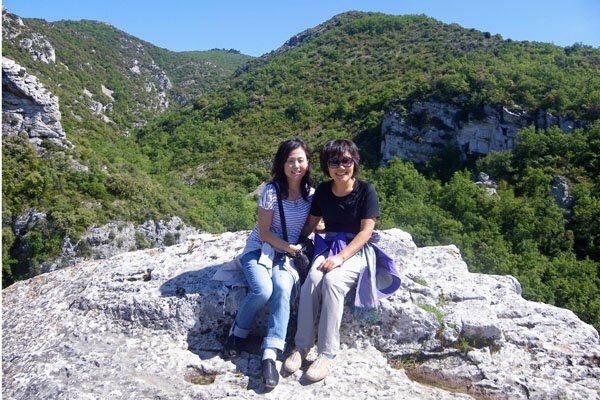 The hike to Fort de Buoux is an optional experience for our group, one that requires a few miles of walking and a slow uphill climb on a rocky path. 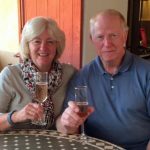 Those that join me often say that it’s one of the most memorable experiences of their week… certainly something we’d never experience at home. 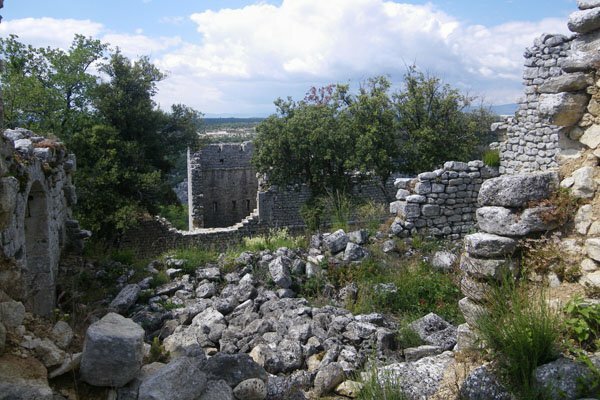 Fort de Buoux occupied a very strategic place in this area, a rocky spur overlooking the mountain pass and a view of the surrounding area that extends for miles. 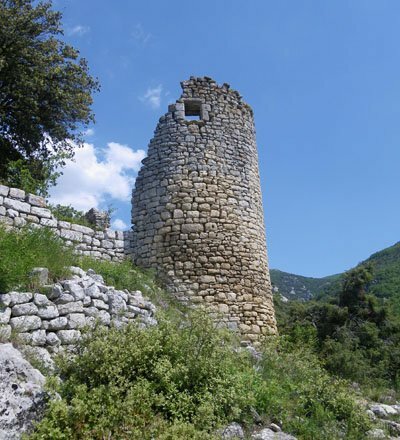 There are watchtowers, defensive walls, habitations cut into the stone, storage silos for grain, cisterns, fields, the ruins of a 13th century church, the remains of a massive fort at the very top of the rock, and a secret escape stairway. This area was probably occupied during the Celto-Ligurian era (1000 BC) and later by the Romans. Many of the visible structures date to the 13th century, and Fort de Buoux was an important stronghold during the Wars of Religion in the 16th century. The site was destroyed in 1660. But the history of this places dates back even further… perhaps 100,000 years when the area was occupied by prehistoric man. 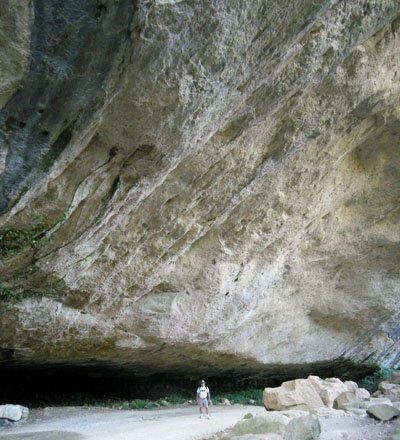 The path to the Fort passes a massive rock overhang, creating an “abri” or prehistoric shelter. 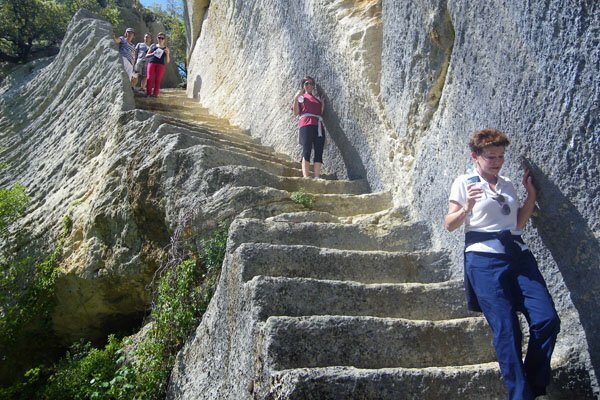 Nearby are remains of ancient tombs cut into the rock, believed to date back to the 9th century. The path continues through the woods, finally reaching a clearing at the base of the rocky spur. If you know where to look, you can see bits of the Fort above. I always enjoy our stop at the caretakers’ house. A husband and wife live here year-round, collecting a small admission from visitors and caring for the property. 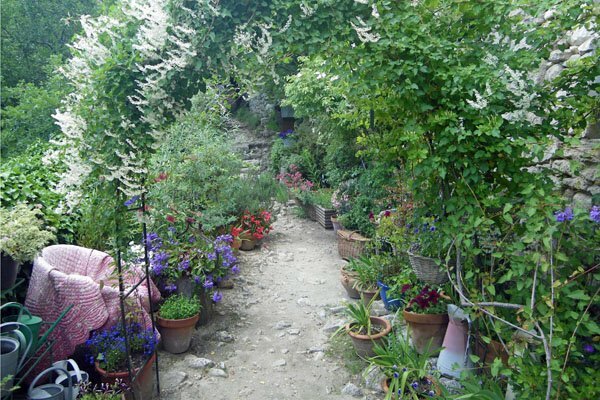 Madame has a beautiful garden, cultivated with love on a narrow shelf of land, and I always try to compliment her. It’s a special spot for me. 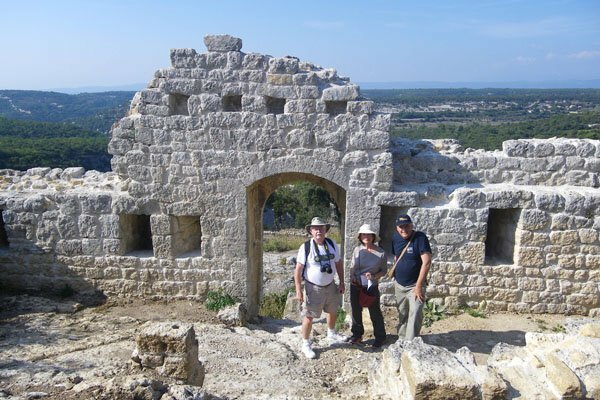 The last several years there’s been some meaningful archaeological work at Fort de Buoux, including a partial restoration of the 13th century church…. kind of like putting together a three-dimensional jigsaw puzzle. I’ve talked to the archaeologist from Marseille several times. This May he had a group of hard-working soldiers from the French Foreign Legion assisting him with various projects at the site. 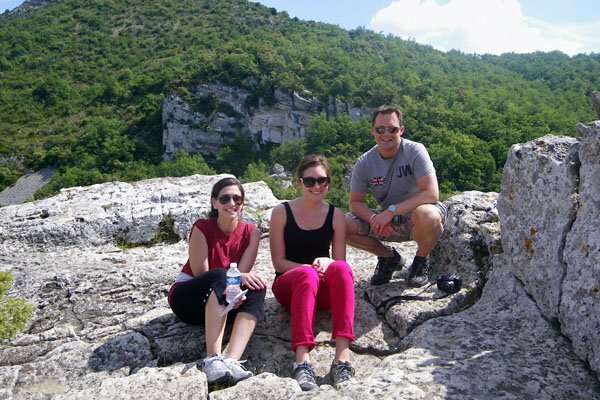 The views from Fort de Buoux are truly spectacular, expanding as you climb steadily up the rocky spur. 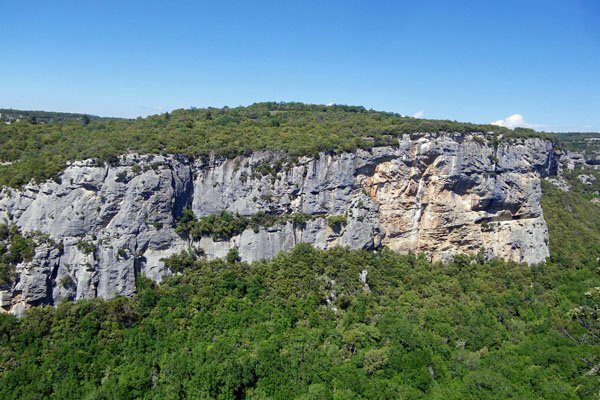 When we arrive on a small plateau, there’s a perfect view of the large rock wall on the other side of the Aiguebrun valley; sometimes we can identify rock climbers on the massive face. 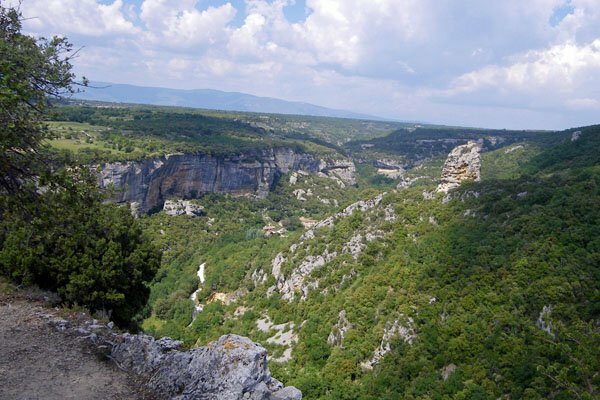 The Petit Luberon extends to the west and the Grand Luberon rises to the east, the tiny village of Sivergues above the valley. Eventually Mont Ventoux comes into sight, and on a clear day you can see all the way to the Pre-Alpes, sometimes topped with snow. Finally, after weaving through several defensive walls, mounting stone stairs, crossing a moat, and walking up a steep slope, my group and I reach the end of the rocky point. 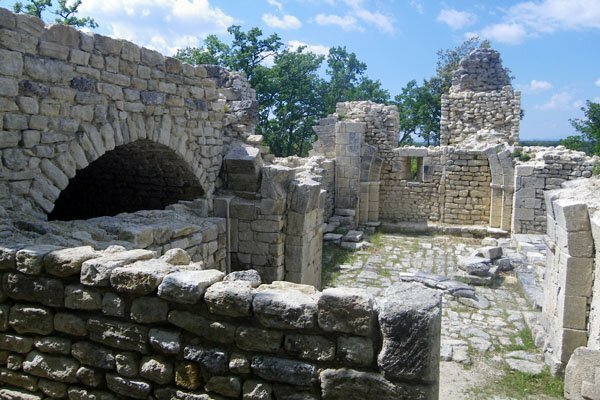 There’s a final walled area, a small cistern, and a stone structure that some experts have speculated was once used for pagan rituals. There’s a sheer drop off at the end of the point… it’s scary! But almost everyone crawls out to the ledge for a photo. We made it! Enjoy this little tour of Fort de Buoux, featuring photos from my four visits over the past 12 months. Special thanks to those travelers who joined me on this expedition! I love the beautiful garden at the Caretakers house. 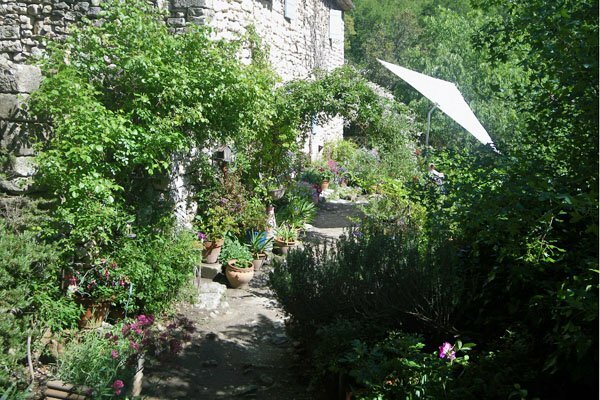 As we head up the rocky path to the Fort, a look back at the Caretakers garden. 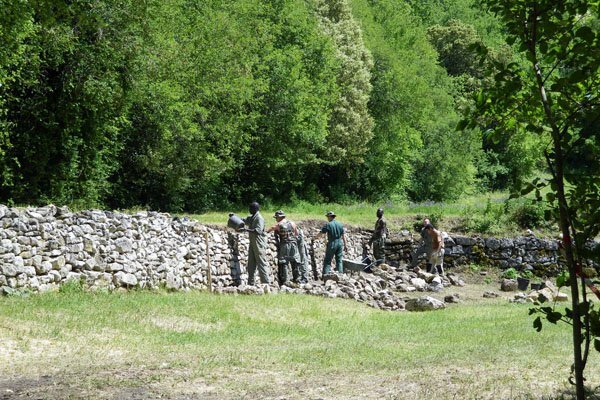 In May French Foreign Legion soldiers assisted with restoration work. This watchtower near the base of the site was an important part of the Fort’s defensive system. 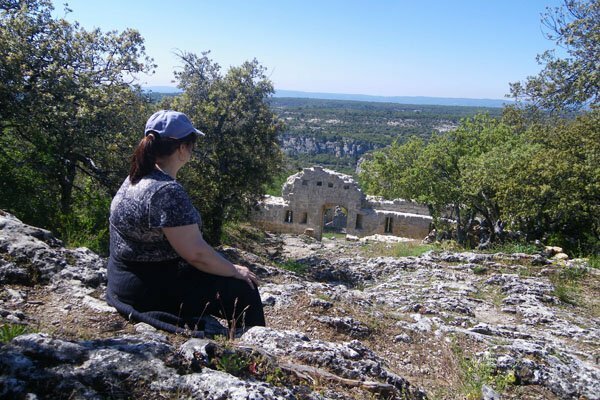 A group of Luberon Experience travelers at Fort de Buoux. 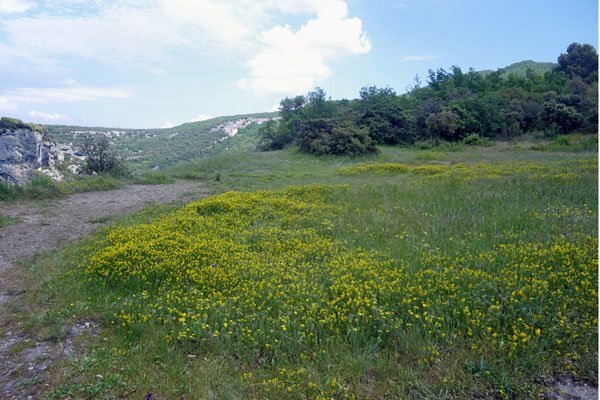 This beautiful meadow is on a plateau, high on Fort de Buoux. There’s been a major archaeological project to restore the 13th century church. For such an isolated spot, this was a large church. As we pass through the ruins, we try to imagine what life was like here 500 years ago. The trail ends on this rocky point. Caution!! 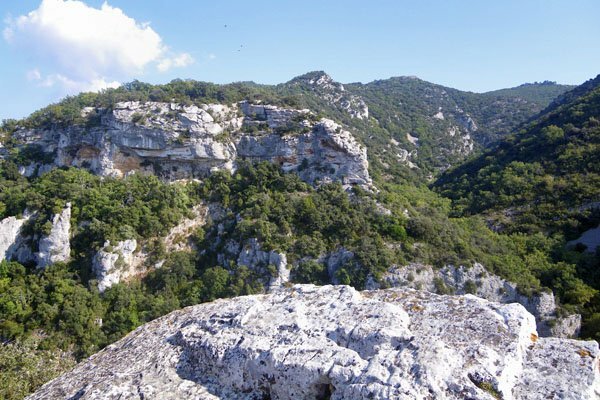 There’s a beautiful view of the Aiguebrun Valley, looking east from the top of Fort de Buoux. 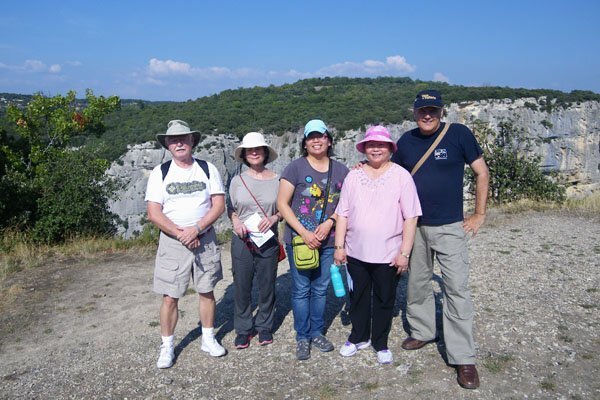 Another group of Luberon Experience travelers reach the top of Fort de Buoux. 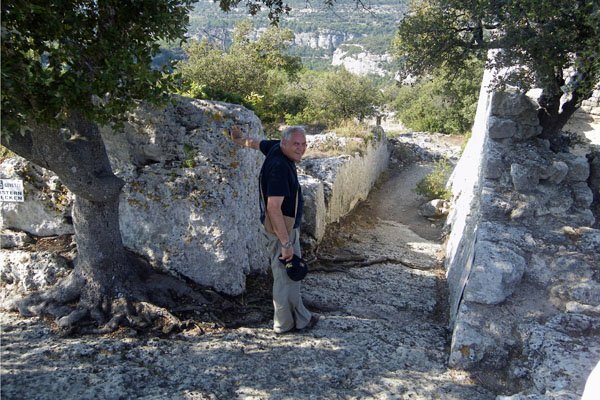 These hidden stairs provided an escape route from Fort de Buoux.